Gone are the days of cocktail bars at 30,000 feet and complimentary meals. We are ushering in cramped legs in stripped-down flights — but with it comes more and more affordable travel. In Europe, air tickets are at unprecedented lows thanks to competition among several low-cost airlines. So to get out of the City of Light on the cheap — or come visit as cheaply as possible, saving those precious pennies for pasteis (pastries) and port — here’s a rundown of the budget-friendly carriers serving Lisbon. The original low–cost airline is the first choice for many. The airline equivalent of in-app purchases will keep you hungry yet sober throughout the flight as the sandwich menu peeks out at you from amongst the safety information cards. The strange music, voice-over, and inevitable clapping at the end of every flight will leave you with a smile on your face when you land. With budget airlines, the price quickly jumps if you plan to check luggage, so most travelers opt for sticking just with hand luggage. You are allowed one main item with a maximum of 55cm x 40cm x 20cm and a weight of 10kg. You can also bring a smaller bag (like a laptop case), restricted to 35cm x 20cm x 20cm. And remember to check in AND print out your boarding pass (or download their app). Doing so at the airport will cost you bigly. Also, Ryanair usually flies into a different terminal than “normal” airlines. In Lisbon, that’s ok — a free shuttle will deliver you to the main terminal. But in many cities, Ryanair lands in some pretty strange locations. Like, the shuttle from the airport to the city may cost more than the flight (true story). This is the second biggest player in the European low-cost market. Easyjet and Ryanair are often indistinguishable and the deciding factor for most people is who happens to be offering the lowest price at the time and where you are flying. Easyjet has a (very slightly) more generous main hand-luggage allowance, at 56cm x 45cm x 25cm and no weight restriction, but they do not allow for a second, smaller carry-on. This could be a big problem for many, especially if you are planning on working from your laptop during your travels. This airline out of Spain seems to regularly offer some of the cheapest flights available in the Iberian Peninsula and can provide a tempting alternative to the bigger names in budget flying, as this one does both short- and long-haul flights. It’s also one of the few budget air carriers around the world to offer a frequent flyer program that’s part of a bigger alliance of other airlines, including British Airways, American Airlines, Cathay Pacific, and more. Using AirEuropa’s so-called Avios points to actually book flights can get complicated, but hey, you get what you pay for. Assuming that you are hopping around Europe and will be flying economy class, AirEuropa’s hand luggage allowance is 55cm x 35cm x 25cm, with a maximum weight of 10kg. Vueling flights between Lisbon and Amsterdam, Rome, Paris, and Barcelona are pretty much always marked at a good price. After its 2008 merger with Clickair, Vueling now serves over 50 destinations so it occasionally has affordable fairs elsewhere too. Even better, if you collect Avios, Puntos, or Iberia Plus points, you can use them here, though their website doesn’t make it easy. Surprise, surprise. You can carry one piece of hand luggage no heavier than 10 kg and no larger than 55x40x20cm, which must go in the overhead locker. You can also carry another smaller bag or case measuring no more than 35x20x20cm and one additional bag containing any purchases made at the airport. They must both fit under the front seat. Rules, rule, rules. This relative newcomer to the budget airline scene has grown pretty darn fast. Air Transport World awarded this Hungary-based airline the 2016 Value Airline of the Year Award for their ticketless travel program and their comfortable leather seats, but don’t think you’ll get free sausages or even peanuts out of the deal, because you won’t. At least not for free. Their best deals out of or into Lisbon are to or from Eastern Europe. When flying with WIZZ, each person can bring one small cabin bag, no larger than 42x32x25cm. If you tend to make last-minute gift purchases, fear not, the airline allows duty-free items on board. Don’t exclude non-budget airlines from your search! They can definitely be worth it if you intend to check luggage. The ticket may be €40, but if you have to pay another €70 for checked luggage, that €110 BA flight starts looking mighty attractive. Plus, if you’re a staunch supporter of all things Portuguese (força! ), TAP is a good bet — especially if you’re looking for a hassle-free trans-Atlantic flight to or from Newark. Or maybe this one time you just feel like getting fancy. Flight aggregators, by the way, are getting better and better at finding budget airlines. Sites like SiteScanner.com and Momondo often find even cheaper tickets than the ones offered by the airlines directly. 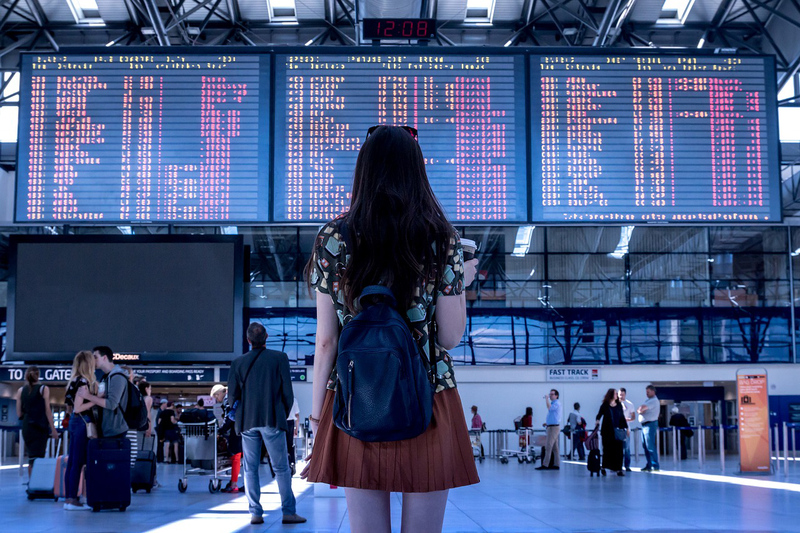 They are also very good about finding connecting flights on multiple budget airlines, for now, because obviously airlines are always trying to find new ways to charge more. Across all these airlines, wait times tend to be okay, although the queues at boarding gates can be a little daunting. But if you don’t want to faff about with your hand luggage on the plane, finding space overhead, etc., and don’t mind your bag going in the hold, simply sit down when people start queuing to board. Normally, the crew will check any luggage for free that they don’t expect to fit in the cabin. And if you don’t have to race people for space in the overhead lockers, there is no need to stand in line. Double win. Remember that airlines tend to change policies quite regularly, so check the rules when you buy your ticket. Waiving your printout of AtlasLisboa probably won’t help at the check-in desk.